A double decker bus affectionately named 'Ozzie' in a public poll has been transformed into a charity shop on wheels, thanks to a donation from Go North East. The vehicle, which was gifted by the region’s biggest bus company to Gosforth-based St Oswald’s, has been given an overhaul to install a heating system and kitchen, so it can be used as a mobile store, workshop and venue. Available to local businesses for private hire, the multi-functional space is also designed to host meetings or corporate events. 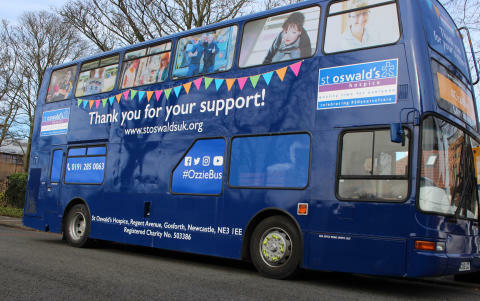 With plans to visit fairs, festivals and public events across the region, Ozzie Bus will act as new tool to help the hospice raise over £7.5 million every year – the sum it desperately needs to provide specialist care for patients with life-limiting conditions. Hospice staff and volunteers, alongside North East patients and their families, were among the first to climb aboard the charity bus to see its transformation, which includes a new boldly-designed exterior synonymous with St Oswald’s, and the message ‘thank you for your support’. The bus operator previously supported St Oswald’s through its Great North Snowdogs fundraising campaign. The popular public art trail - one of the largest and most successful mass participation events ever held in the North East, showcased dog sculptures across the region, with Go North East’s dog designed by British actress Joanna Lumley. To find out more about St Oswald’s, go to: www.stoswaldsuk.org. For additional information about Go North East, visit www.gonortheast.co.uk.